WANZL Press Conference | 6 March 2017, 1.00 p.m.
Room 8 CCD South (between Halls 1 and 3), 1st floor. The traditional bricks-and-mortar retail trade has reached a historic turning point and is striving for successful answers to the questions raised by digital change. About 70 years ago, self-service shopping heralded a similar consumer revolution, and the retail trade had to re-invent itself. Today, the right solutions are almost certainly only to be found in close exchange between retail and industry – let's make a start with #uptrade with wanzl at EuroShop 2017! Monday 6 March 2017, 1.00 p.m.
Congress Center Düsseldorf (CCD), Room 8 CCD South (between Halls 1 and 3), 1st floor. Find out how Wanzl is offering bricks-and-mortar retailers a multitude of intelligent solutions for the future, creating new prospects in every direction! This is because, in future, retail shops will have to focus even more on strengths such as shopping experience and service in order to stay on the road to success. At the same time it is also important to counter the previous competitive advantages enjoyed by online retail with regard to customer knowledge and logistics, and to optimise branch management and operational procedures. Please register for the press conference by 17 February 2017 at the latest. Simply reply by email or DOWNLOAD the attached form. WANZL is looking forward to meeting you! The shopping of tomorrow begins today. We are ready. Wanzl and EuroShop have written success stories together. The 19th EuroShop 2017 event is 50 years young. 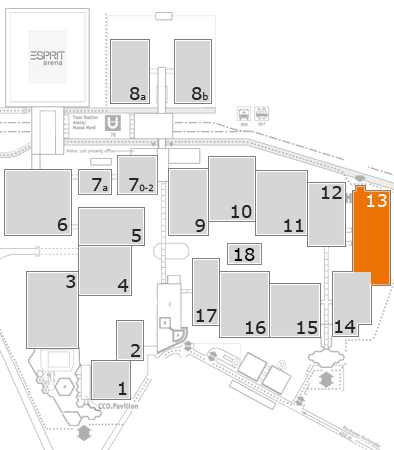 In Hall 13, Stand A89, Wanzl – one of the world's leading system partners – invites visitors to discover the future of bricks-and-mortar retail on an exhibition space of 1400 m2. #uptrade with wanzl starts now! The digital consumer revolution is in full swing. One of the focal points of Wanzl's #uptrade with wanzl programme at the EuroShop event is how food markets and farmers' markets become very good retailers in the age of e-commerce. The wanzl connect software-based solution controls all in-store processes and collects useful customer data, enabling retailers to make shopping as convenient as possible for their customers. The Wanzl Customer Connect app component provides shopping lists, personalised offers and information on preferred brands and prices, tailored to customers and their lifestyles. The wanzl connect software architecture comprises the Smart Trolley and Store Management system components, which provide data for Customer Connect and the Click&Collect-Box – the pick-up station for chilled and non-chilled goods. The Smart Trolley, which is equipped with RFID tags, transports the goods and provides important customer information such as the route a customer takes through the store, the length of their visit, their preferred products and the revenue in the trolley basket. This creates transparency on the sales floor and makes it possible, with the help of the connection to the cash register system, to measure the conversion rate for campaigns, whilst also optimising product placement at the Point of Sale and supporting efficient staff planning for perfect customer service. The Store Manager collects all incoming data on one platform. It is the control centre of the store manager of the future. It is used for the intelligent management of a store – from providing sufficient trolleys in the trolley shelter and checkout staffing that ensures customers do not have to endure long waiting times, to cash register control and monitoring of entrance systems, back stations or third-party systems such as deposit stations, refrigeration units, etc. The customer also receives push messages to their smartphone about current offers. This all comes together to boost sales! Other important benefits physical retail offers on the sales floor include personal contact, the freshness of the produce on offer and the store as a place of inspiration, entertainment and shopping, creating a fantastic shopping experience with Wanzl Shop Solutions. Visit uptrade.wanzl.com to read about retail professional Wanzl's views on the networked future of retail, which will connect all distribution channels and use them collectively on an omni-channel basis. The topics of physical retail and shop design plus retail equipment as an exclusive venue experience and entertainment also make for exciting reading. It's EuroShop! The leading international trade fair is opening its doors to visitors from all over the world from 5 to 9 March this year in Düsseldorf. As one of the largest exhibitors and leading retail partners of global commerce, Wanzl will be presenting its food and near-food solutions for the upcoming consumer revolution in hall 13/stand A89. What does the future look like for traditional retail around the world? How are online and offline services connected to generate sales in shops and on the web? #uptrade with wanzl uses its 1,400 m2 to present ideas that offer traditional retailers a real competitive edge. The focus is on digital data with Wanzl Connect, because experiencing the customer journey through the shop requires data acquisition that is on a par with the online players. Wanzl's smart RFID-enabled shopping trolleys provide precise figures, allowing retailers to adjust the store in the most appropriate way to increase customer loyalty and to bring cash into the tills. Digital technologies connect mobile terminals for shopping lists, self-payment and indoor navigation. If customers shop online, Wanzl logistics solutions for home delivery really keep things moving with the “picks per hour”. e-commerce is booming. However, shops for food and near-food items are, and will remain, the main place for inspiration and entertainment, incorporating emotiveness, brand identity and an unlimited shopping experience. The Wanzl shopfitting boxes lead the way in demonstrating a retail experience which strikes the perfect balance between the staging of the shop and product presentation. They create a unique and fresh brand identity for each store. For the first time, Wanzl is also incorporating a till area in the design of the shop, developed by the company specifically for this purpose. Convenience is another major topic in 2017, and Wanzl is calmly keeping up as a system partner, offering innovation and providing tasting stations that tempt customers to make purchases. The first updates from Wanzl will be available before EuroShop 2017 at uptrade.wanzl.com.